Well, everyone wants to talk about rates these days and it’s no mystery why. The Fed is under new leadership at a pivotal juncture. Balance sheet rundown has commenced and the Trump administration has embarked on what multiple sellside desks (see here, here, and here for a few takes) have described as an ill-advised quest to try and supercharge an already hot economy with late-cycle expansionary fiscal policy. And so, the supply/demand dynamic in the Treasury market has shifted. Financing the tax cuts and increased spending means more supply and with the Fed out of the market, it’s left to price sensitive private investors to provide the bid. This comes as the global reserve diversification debate heats up and as second-order effects of increased bill supply could further sap foreign demand for U.S. debt (see here). To be sure, the market will clear – the question is, at what price? That gets to the heart of the debate about where yields go from here and the concern is that between everything said above and the suspicion that between fiscal stimulus and now tariffs, price pressures could build quickly, the Fed will be forced to take a hawkish turn that’s not yet priced in by markets. All of these concerns helped fuel the bond rout that conspired with the February 5 vol. shock to send global equities careening into correction territory last month. Well, one person you might be interested in hearing from on all of this is Jim Grant, and happily, Erik Townsend welcomed him to the MacroVoices podcast this week. You can listen to the interview in full below, but here are a couple of excerpts that touch on the questions everyone wants answered. The rising interest-rate trend in the US isn’t new and isn’t related to the Fed’s so-called “policy normalisation” program. However, it has only just started to matter. 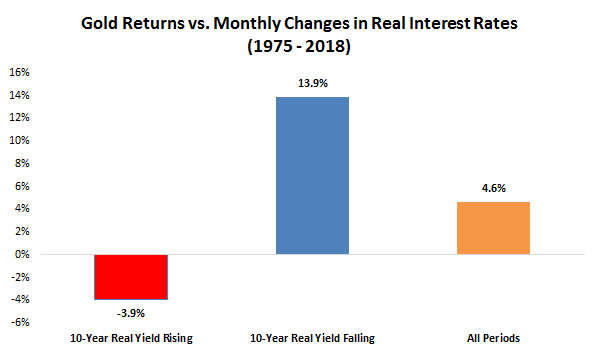 That the rising interest-rate trend isn’t new and isn’t related to the Fed’s rate-hiking efforts is clearly illustrated by the following chart. This chart shows that the US 2-year T-Note yield began trending upward in 2011 — more than 6 years ago and more than 4 years prior to the Fed’s first rate hike. As we go further out in duration we find later beginnings to the rising-yield trend. 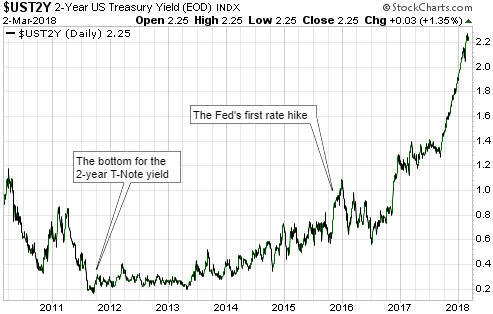 This is evidenced by the following three charts, the first of which shows that the 5-year yield bottomed in mid-2012, the second of which shows that the 10-year yield double-bottomed in mid-2012 and mid-2016, and the third of which shows that the 30-year yield continued to make lower lows until mid-2016. But even in the case of the 30-year yield the rising trend is now more than 18 months old. Yes, The Fed’s version of Rigor Mortis (aka, Fed-or Mortis) is setting in. Mortgage applications increased 2.7 percent from one week earlier, according to data from the Mortgage Bankers Association’s (MBA) Weekly Mortgage Applications Survey for the week ending February 23, 2018. This week’s results include an adjustment for the Washington’s Birthday (Presidents’ Day) holiday. The seasonally adjusted Purchase Index increased 6 percent from one week earlier. The unadjusted Purchase Index decreased 1 percent compared with the previous week and was 3 percent higher than the same week one year ago. The Refinance Index decreased 11 percent from the previous week. The US Treasury 10Y yield appears to have bounced off a reflecting barrier — the 3% yield barrier. For the German Bund, it is reflecting off of the 75 basis point barrier.